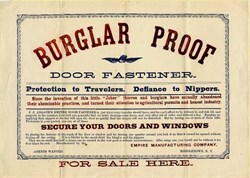 Beautiful broadside from the Empire Manufacturing Company for a Burglar Proof Door Fastener printed in the 1880's. This historic document has an ornate border around it with a vignette of an eagle and is over 125 years old. The inventor of this product was J. J. Adgate. This wonderful broadside says things like " Protection to Travelers. Defiance to Nippers" and "Since the invention of this little 'Joker' thieves and burglars have actually abandoned their abominable practices and turned their attention to agricultural pursuits and honest industry."